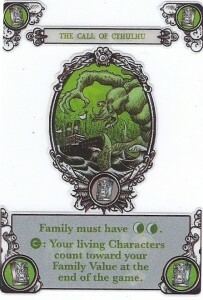 So after playing regular Gloom someone brought in the Cthulhu version of gloom and we set down to play it the night it came in. 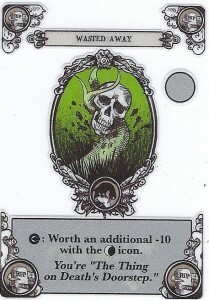 Well I gave it a shot and I didn't like it as much as regular Gloom but it was interesting. The game was a double edge sword almost every card that gives the negative score that you want causes you to do something you don't want to do such as discard your whole hand leaving it hard to make a good strategy. In this one like the first I liked the red family in this one they are a university group. While the game is interesting I don't like it as much as the original. At one time we combined the original with Cthulhu and it did make the game better but still not as fun as the original by itself. I give this game 3 out of 5 stars. Wow! This game looks really interesting!